For other uses, see Terrace (disambiguation). 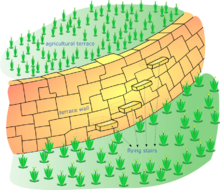 Diagram showing Inca terrace engineering for agriculture. In agriculture, a terrace is a piece of sloped plane that has been cut into a series of successively receding flat surfaces or platforms, which resemble steps, for the purposes of more effective farming. This type of landscaping is therefore called terracing. Graduated terrace steps are commonly used to farm on hilly or mountainous terrain. Terraced fields decrease both erosion and surface runoff, and may be used to support growing crops that require irrigation, such as rice. The Rice Terraces of the Philippine Cordilleras have been designated as a UNESCO World Heritage Site because of the significance of this technique. 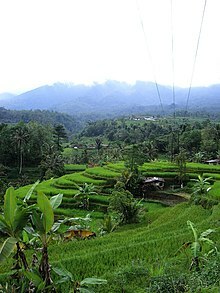 Terraced paddy fields are used widely in rice, wheat and barley farming in east, south, and southeast Asia, as well as the Mediterranean, Africa, and South America. Drier-climate terrace farming is common throughout the Mediterranean Basin, where they are used for vineyards, olive trees, cork oak, etc. In the South American Andes, farmers have used terraces, known as andenes, for over a thousand years to farm potatoes, maize, and other native crops. Terraced farming was developed by the Wari culture and other peoples of the south-central Andes before 1000 AD, centuries before they were used by the Inca, who adopted them. The terraces were built to make the most efficient use of shallow soil and to enable irrigation of crops by allowing runoff to occur through the outlet. The Inca built on these, developing a system of canals, aqueducts, and puquios to direct water through dry land and increase fertility levels and growth. These terraced farms are found wherever mountain villages have existed in the Andes. They provided the food necessary to support the populations of great Inca cities and religious centres such as Machu Picchu. Terracing is also used for sloping terrain; the Hanging Gardens of Babylon may have been built on an artificial mountain with stepped terraces, such as those on a ziggurat. At the seaside Villa of the Papyri in Herculaneum, the villa gardens of Julius Caesar's father-in-law were designed in terraces to give pleasant and varied views of the Bay of Naples. Terraced fields are common in islands with steep slopes. The Canary Islands present a complex system of terraces covering the landscape from the coastal irrigated plantations to the dry fields in the highlands. These terraces, which are named cadenas (chains), are built with stone walls of skillful design, which include attached stairs and channels. In Old English, a terrace was also called a "lynch" (lynchet). An example of an ancient Lynch Mill is in Lyme Regis. The water is directed from a river by a duct along a terrace. This set-up was used in steep hilly areas in the UK. Terraced fields in Sa Pa, Vietnam. Terraced field in Kabal Swat valley, Pakistan. Terraced farmland in Peru, adopted by the Inca. Terraced hay fields in the Upper Mississippi River basin during the 1930s. Jatiluwih rice terrace in Bali, Indonesia. The Batad Rice Terraces in Ifugao, Philippines. The Banaue Rice Terraces in Ifugao, Philippines. Rice cultivation, Lower Himalayas, Nepal. Longsheng Rice Terrace in Longsheng county, Guangxi Province, southern China. Image from Yuanyang, showing the rice terrace walls after harvest, weed removal, flooding and plowing. Terraced mixed citrus and olive groves in the Lecrin Valley, Andalusia, Spain. ^ "Farming Like the Incas". Smithsonian Magazine. Retrieved 2015-09-20. ^ Martín, Lidia & González Morales, A & Ojeda, Antonio A.. (2016). Towards a new valuation of cultural terraced landscapes: The heritage of terraces in the Canary Islands (Spain). 26. 499-512. 10.19233/ASHS.2016.31. ^ Whittington, G. (1967-01-01). "Towards a Terminology for Strip Lynchets". The Agricultural History Review. 15 (2): 103–107. JSTOR 40273237. Wikimedia Commons has media related to Agricultural terraces.